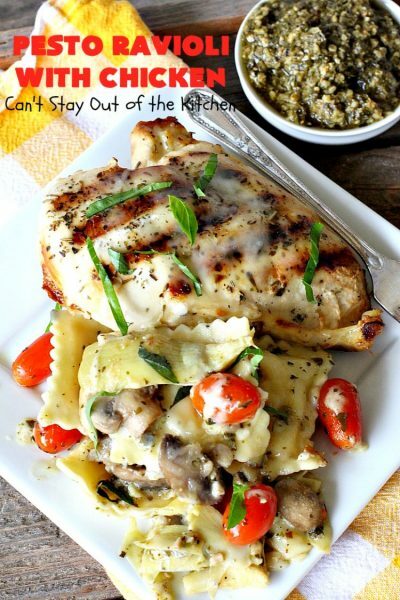 Pesto Ravioli with Chicken is so mouthwatering and succulent you won’t be able to resist it! 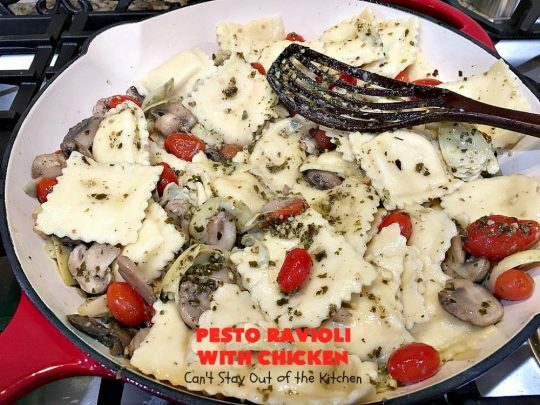 This entree is a wonderful new take on ravioli, especially if you enjoy pesto like I do. Cheese ravioli is served in a delicious pesto sauce with artichokes, mushrooms, tomatoes and cheese. 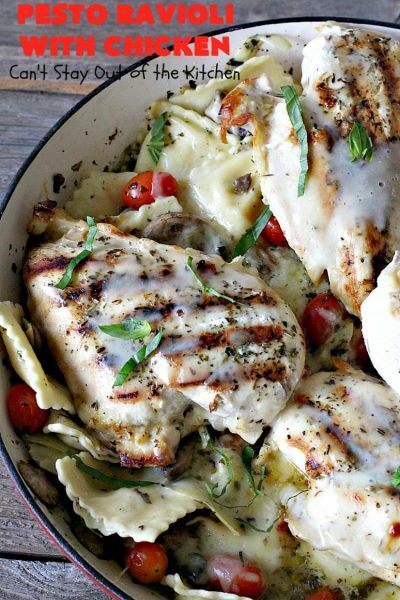 Then it’s topped with grilled chicken breasts. I use my favorite Italian cheese blend because it melts wonderfully and tastes so incredibly good. This cheese blend has mozzarella, parmesan, romano, asiago, fontina and provolone cheeses. I find it a superior cheese blend for any kind of Italian dish where cheese is part of the topping. It is much better than simply using parmesan or mozzarella cheeses alone. Last Sunday I was trying to make a meal for some friends who moved into their new home the preceding Friday. We had just gotten back in town from a funeral for my younger brother. I knew I wanted to make them a meal but it would have to be fairly quick and easy. I decided to make the Eclair Dessert before we left and put it in the freezer. I also made up a batch of Refrigerated Crescent Rolls so the dough would be ready to roll out that Sunday after we got home from church. The nice thing about the dough is that it keeps a week in the refrigerator. Another win-win for me! The Special Strawberry Spinach Salad would only take 5 minutes for the salad and 5 minutes for the dressing, so that was also on the menu. I chose my Broccoli, Cauliflower, Carrots and Cheese side dish because it’s another recipe that only takes about 10-15 minutes to throw together and I was on a time crunch so that was going to be another easy dish to prepare. I’ve made this recipe a couple of times now and here are my suggestions. 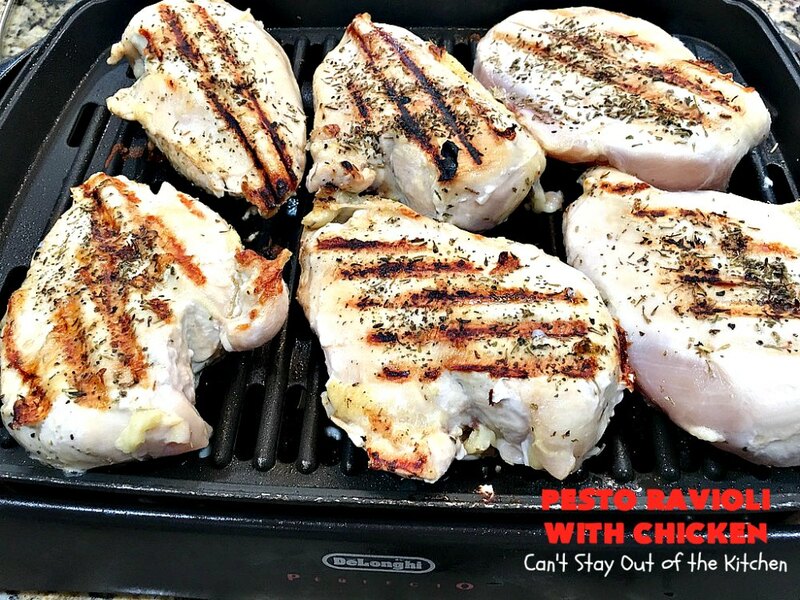 I found this recipe to be tastier when I grilled chicken breasts with Italian seasoning sprinkled on each side. You can slice them down into strips just before serving if you prefer. Or, let each person slice their own chicken down once plated. Don’t use zucchini! It kind of mushes up during the cooking time and becomes too slimy. Ick! 🙁 Also, I liked having the cheese not only stirred into the dish but also as a garnish. The cheese and pesto make this dish something special. If you’re looking for a tasty pasta dish that’s not your typical one made with marinara or Alfredo sauces, then give this tasty Pesto Ravioli with Chicken a try sometime. If you don’t mind taking the time to grill the chicken first, I personally feel that’s your best option. 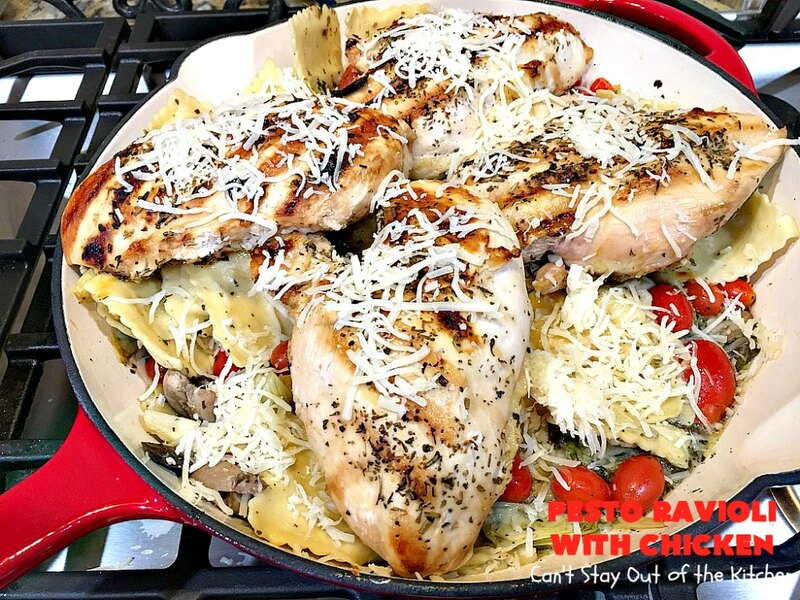 After all the ingredients are assembled, place grilled chicken breasts on top and sprinkle with extra cheese. Cover with a lid for 5 to 10 minutes until the cheese melts. One more suggestion: you may find it easy to prepare the base part of the recipe in a large Dutch oven rather than the large skillet shown in the pictures. Or, you can use two large skillets. One won’t be enough to hold everything. When I initially posted this recipe in May 2014, I made the recipe with zucchini and bell pepper strips. 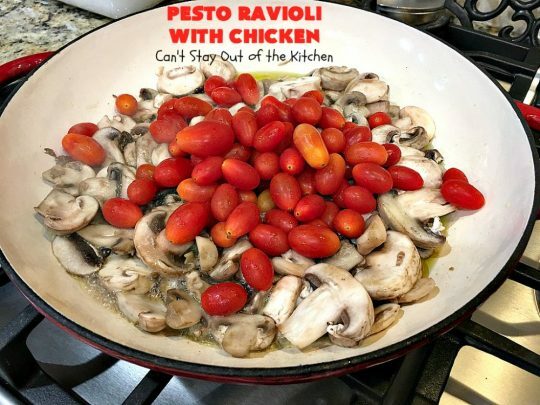 I decided to remake this recipe (October 2018) for our Friday night care group but made wholesale changes. Instead of following my original recipe, I totally remade the entree. I grilled the chicken but did not cut it down to spread through the casserole. Rather, I placed the pieces on top after the veggies and ravioli were ready. 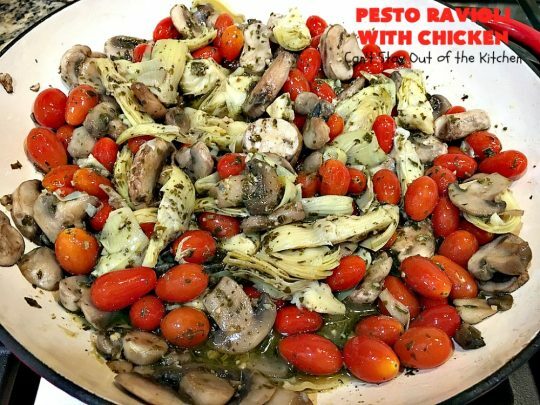 I used mushrooms, tomatoes and artichokes for flavor as well as texture. Artichokes hold up a lot better in casseroles than zucchini. 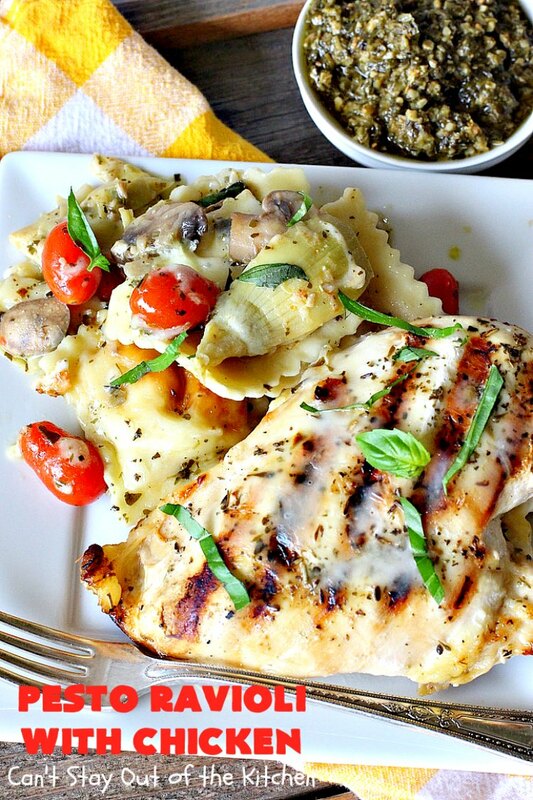 Pesto Ravioli with Chicken is sumptuous and savory. It’s an incredibly tasty entree that’s perfect for company dinners. Pesto sauce flavors the ravioli and veggies wonderfully well. Here, the chicken is served off to the side so you can see the ravioli. 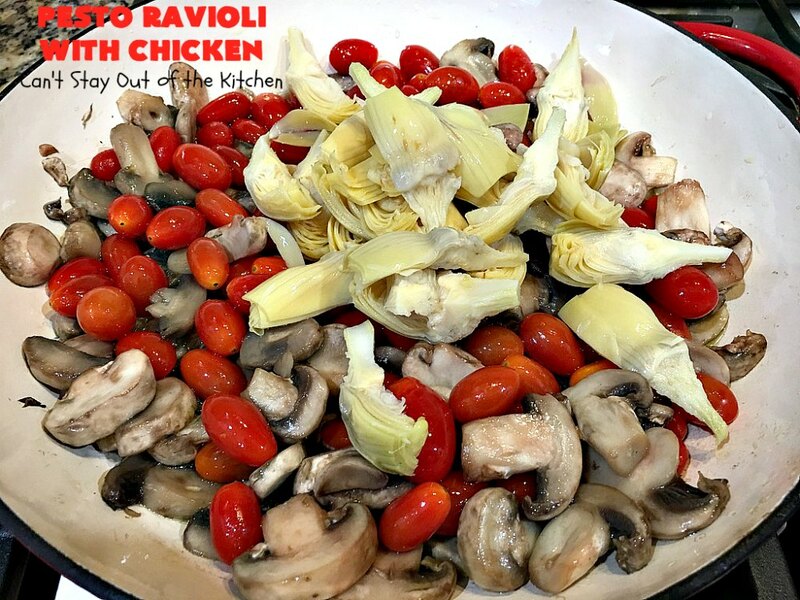 The ravioli includes artichokes, tomatoes and mushrooms. So delicious. You can slice the chicken down before or after serving, depending on your personal preference. I used these ingredients. I used fresh basil for a garnish. 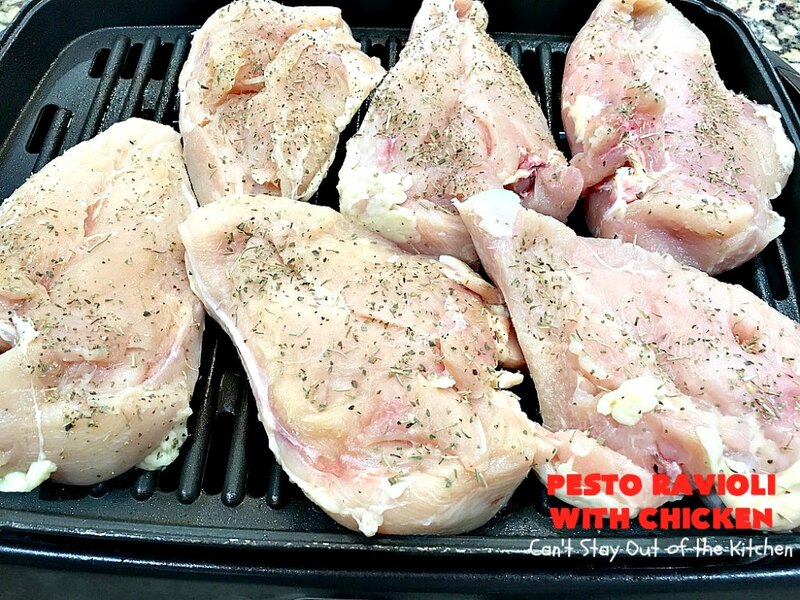 Sprinkle both sides of chicken breasts very generously with Italian seasoning. Place on a hot grill. Turn chicken over and grill on other side. My chicken pieces were whoppers. I had to grill them about 20 minutes on each side to get them cooked all the way through. 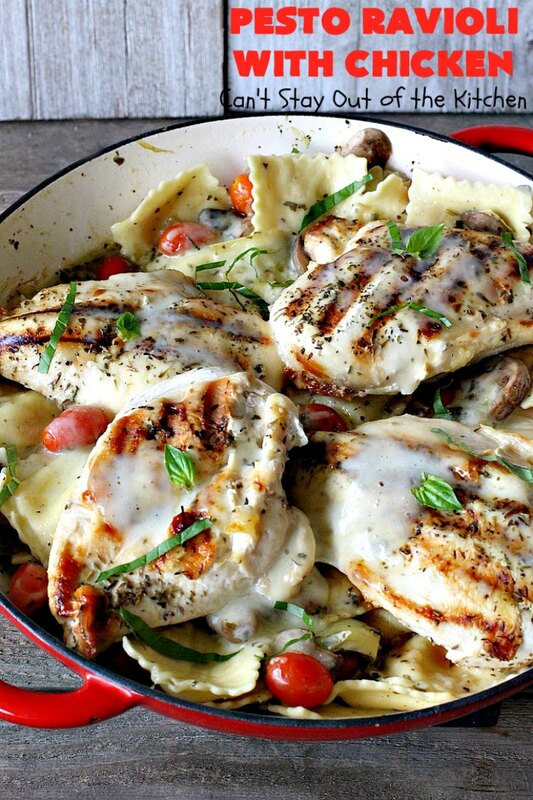 Set chicken pieces aside. Meanwhile, pour chicken broth into a Dutch oven and bring to a boil. 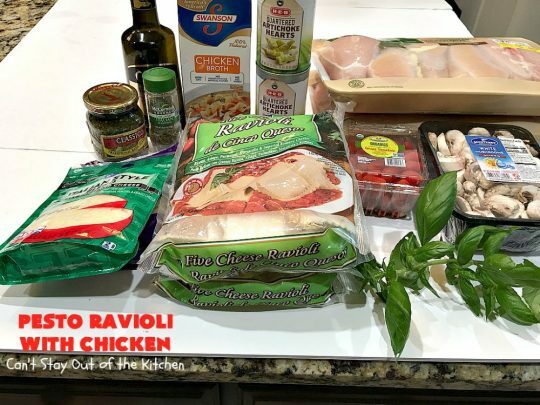 Add frozen ravioli and cook until done – about 7-8 minutes. Drain and set aside. Meanwhile, add olive oil to a large skillet or Dutch oven. Add mushrooms and saute about 5 minutes. Add grape or cherry tomatoes. Saute an additional 5 minutes or so. Add rinsed and well-drained artichokes. Stir gently and cook a few minutes before adding pesto sauce. Stir ingredients gently to combine. This is where it gets tricky. Add cooked and drained ravioli. You really need two skillets or a Dutch oven by this time. Stir gently to combine. Don’t be heavy handed with your stirring otherwise the raviolis will pop open and the cheese will spill out everywhere. Add cheese and stir gently to combine. Add grilled chicken pieces on top. Sprinkle chicken and ravioli with more cheese. Cover with lid and cook an additional 5-10 minutes on a very low heat until the cheese melts. 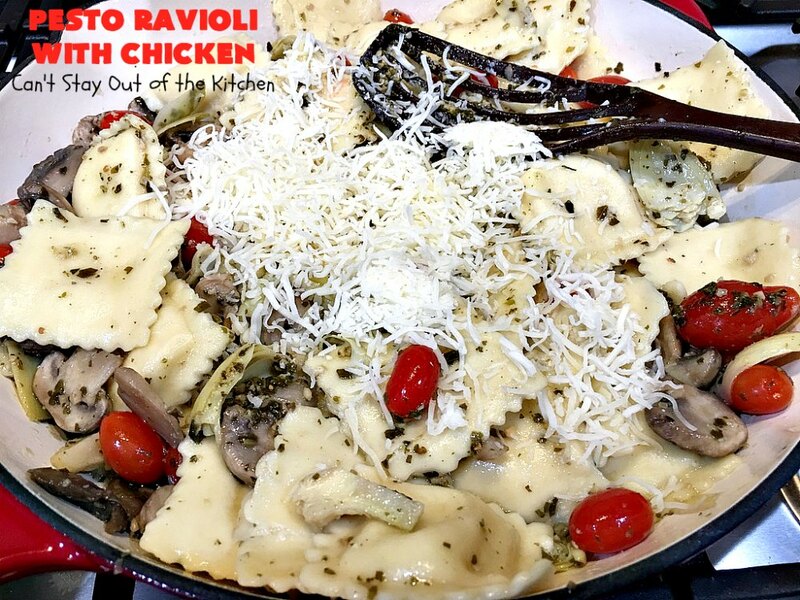 Pesto Ravioli is a tasty way to serve ravioli without always serving it with the traditional marinara sauce or alfredo sauces. Delicious ravioli dish served in a cheesy pesto sauce with artichokes, mushrooms & tomatoes and garnished with grilled chicken & fresh basil. 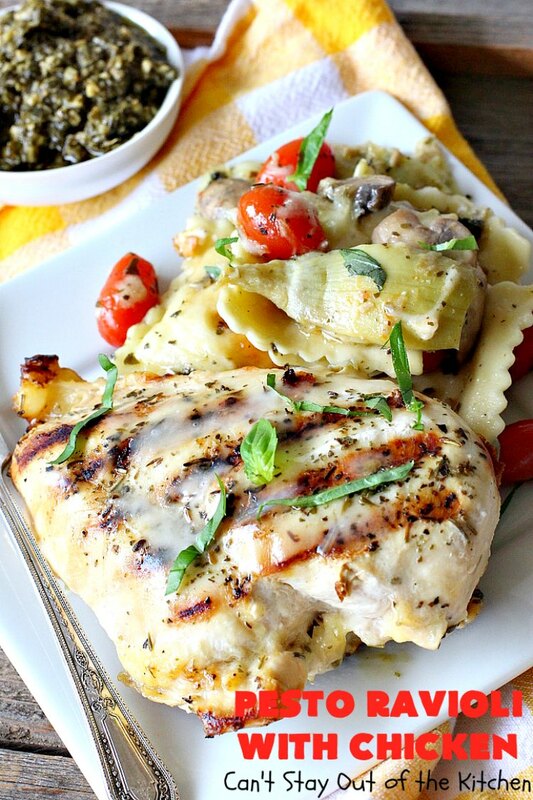 This sumptuous & savory entree is terrific for company dinners. Sprinkle Italian seasoning on each side chicken breasts. Grill chicken breasts until completely done. In large Dutch oven, heat chicken broth to boiling. 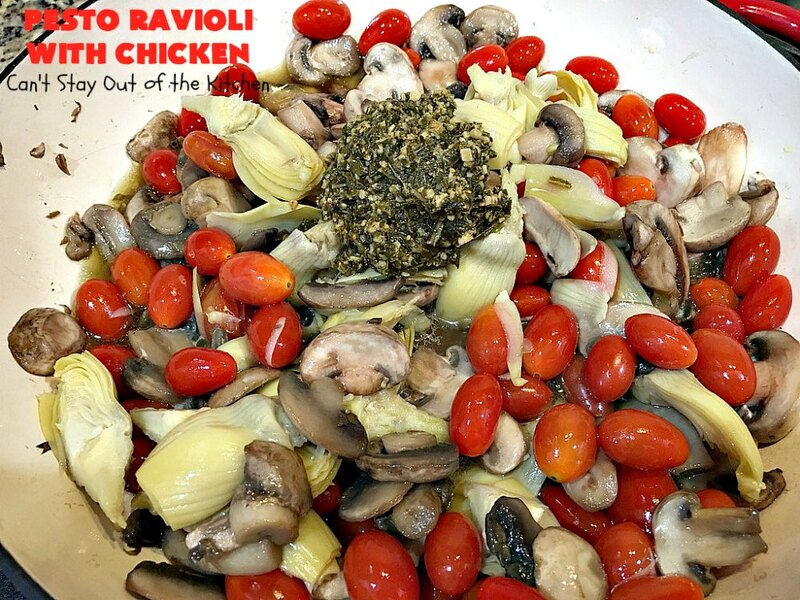 Add ravioli and cover lid. Cook about 5-8 minutes until ravioli is cooked through. Meanwhile, in a large skillet heat olive oil. Add mushrooms and saute about 5 minutes, turning frequently. Add tomatoes and saute an additional 5 minutes. Add artichoke hearts; stir gently and heat through about 2-3 minutes. 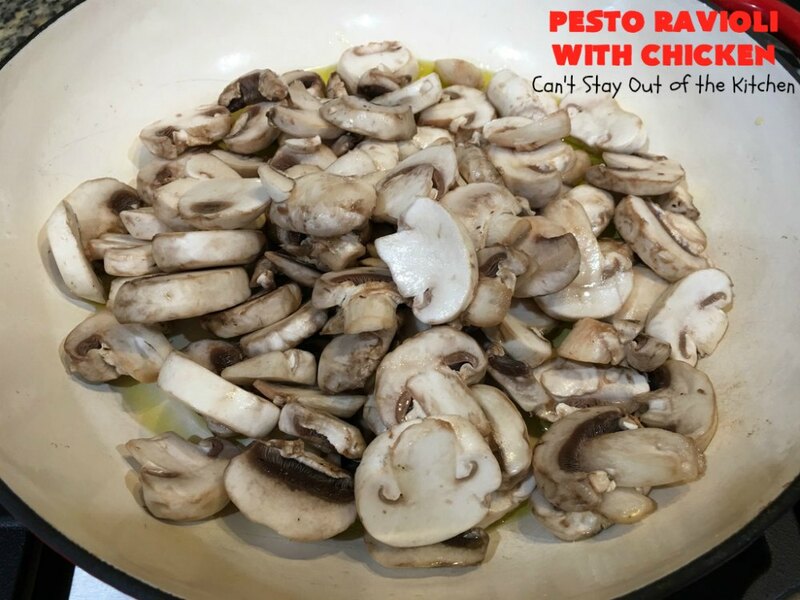 Stir pesto sauce gently into mushroom mixture until thoroughly mixed. Pour half of the veggie mixture into another skillet. 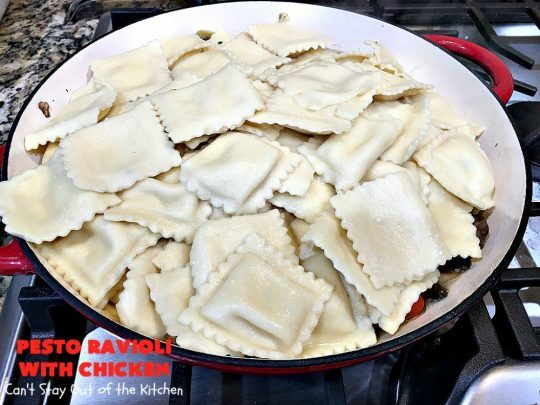 Add half of the ravioli to each skillet and stir gently to raviolis do not burst open. Stir very gently until everything is combined. 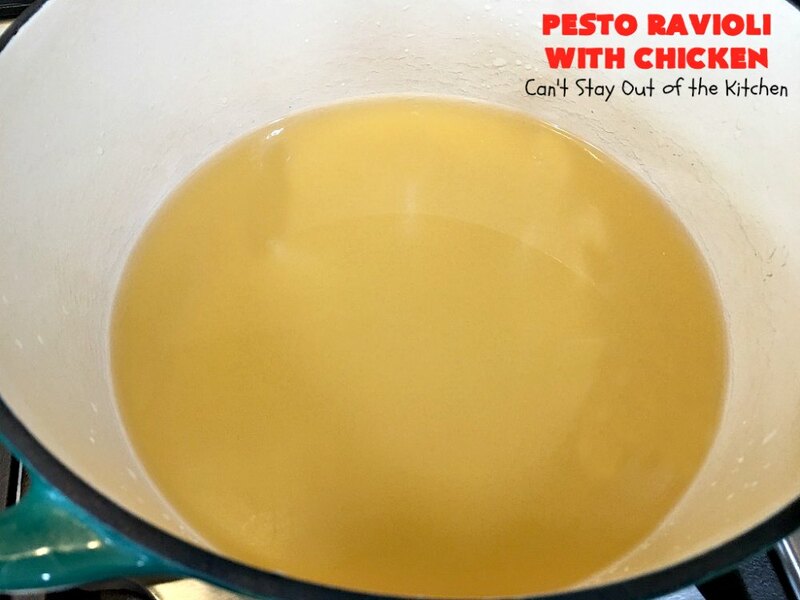 Add one cup of Italian cheese blend to each skillet and stir gently again. Place chicken breasts on top dividing between each skillet. Cover each of the skillets with one cup of Italian cheese blend. Cover with lids and allow cheese to melt – about 5 minutes. Sprinkle each skillet with remaining cup of cheese, if desired. Add fresh basil, for garnish, if desired. 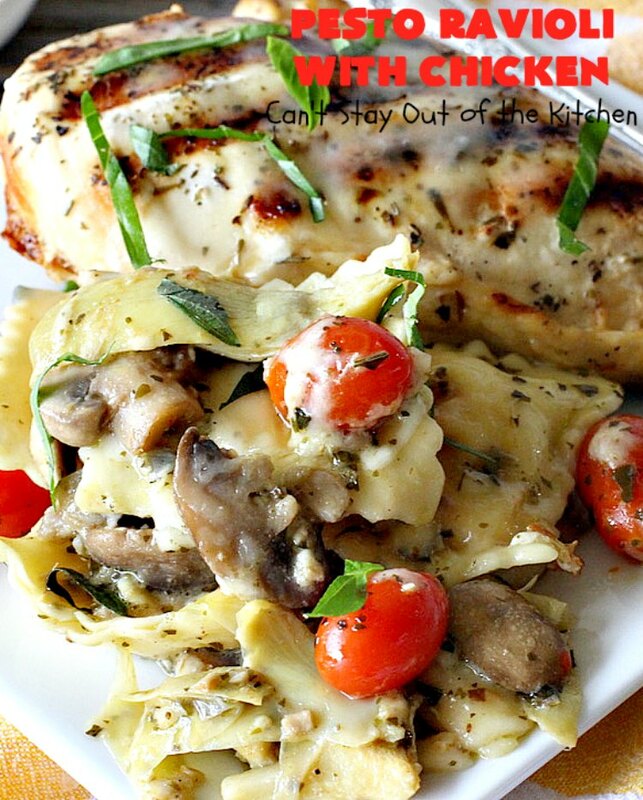 Delicious ravioli dish served in a cheesy pesto sauce with chicken, zucchini and red bell pepper. This recipe turns out quite well if you grill the chicken with Italian seasoning rather than frying. In large sauté pan, pour olive oil. Cut chicken breasts in long strings and place in saucepan over medium heat. Cover with lid and cook about 5 minutes. Turn chicken pieces over and continue cooking until the chicken looks almost cooked through. In large sauté pan or Dutch oven add chicken broth and heat. Add ravioli and cook, covered with lid, for about 5-8 minutes or until ravioli is cooked through. Add zucchini and bell pepper and sauté about 3-5 more minutes. Stir in pesto sauce and heat through. To serve: Spoon mixture into large bowls and garnish with more cheese as desired. I found this recipe tasted better when I grilled boneless chicken breasts with Italian seasoning sprinkled on both sides. Then after the chicken is cooked through (about 20-30 minutes), Slice chicken in strips. 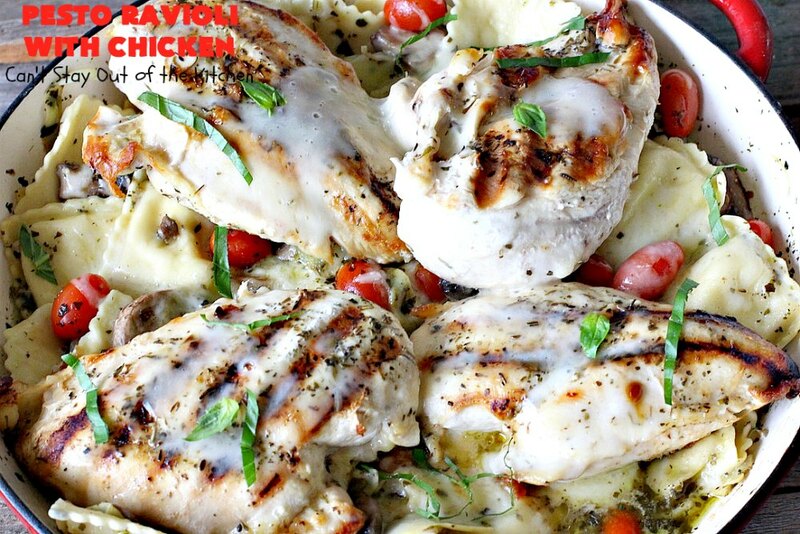 Eliminate the olive oil if you prepare the chicken this way. 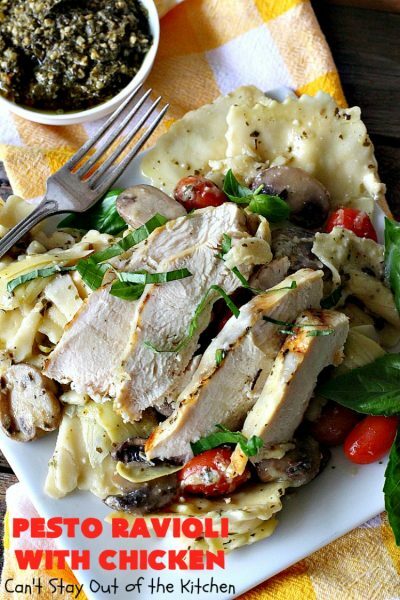 [br][br]This recipe is also good with sunburst cherry tomatoes, onions and mushrooms. [br][br]You can serve this right out of the pot. 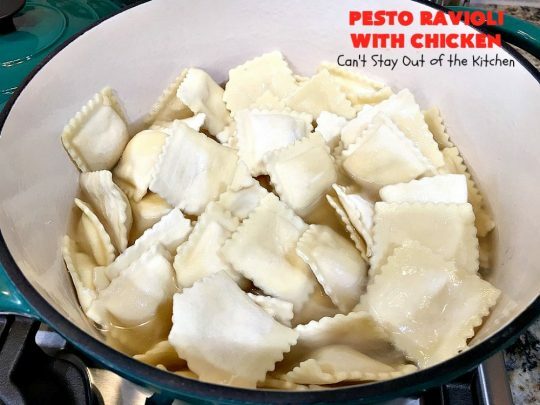 But after adding the initial amount of cheese and stirring it into the ravioli, I poured the pasta into a 10×15” glass baking dish sprayed with olive oil cooking spray. Sprinkle the pasta with additional half cup of Italian cheese blend. Cover with foil and bake about 15-20 minutes at 350° until all the ingredients heat through. 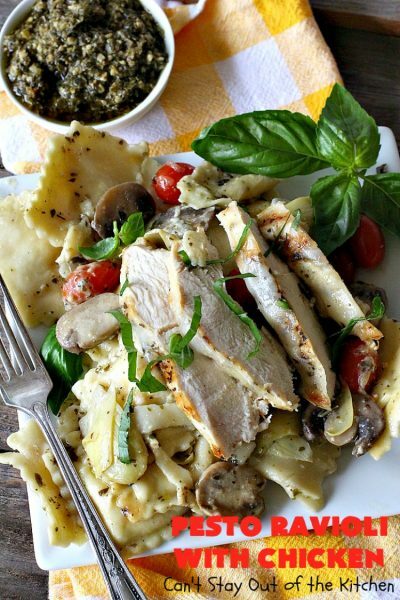 If you enjoy pesto, this is a great recipe for you. I loved the flavor combinations of this tasty dish. Artichokes, tomatoes and mushrooms add great texture and flavor to this delicious Italian entree.